TSI’s Gate Management System includes the ability to create Fantasy Schedules. 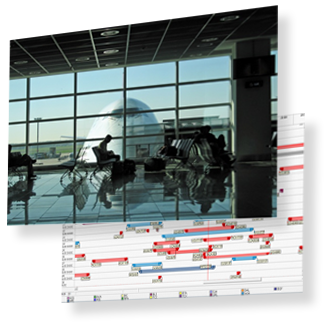 Fantasy Schedules allow gate planning without effecting real-time information. They are an efficient method of comparing gate plans to achieve the optimal schedule. The Gate Management System utilizes both hard and soft rules. Hard rules are the physical restrictions and safety requirements and soft rules are the preferences. TSI’s Gate Management System is designed for the Airport Industry to be rugged, versatile, flexible, easy to use, and affordable. The adaptable GMS solution supports custom gating requirements of individual airports. The airport’s unique characteristics and needs are entered to create the core of the GMS. The system verifies scheduling and prompts the Gate Scheduler of potential conflicts. Using our automated scheduler, the best gating solution can be generated at the click of a button. Graphical Gantt charts allow for quick and easy review of gate schedule. TSI’s GMS gives airport clients the power to make quick and easy gating decisions. Fully supports complete integration to TSI’s FIDS and AODB eliminating duplicate manual data entries which greatly reduces errors and saves time. TSI’s GMS system is flexible in its design allowing users and administrators to modify and refine business and gating rules as required. Unique or custom rules can also be defined using the “Formulas”. The Gate Management System is inherently scalable allowing future growth and customization of the system without outside support or additional licensing. Fantasy schedules allow for advance planning of gate schedules. Further reducing manual data entry, is the optional Flight Schedules Data Service. The GMS offers a wide selection of system reports. Effectively reduces operating costs as the GMS decrease the work required to manage gate scheduling. The GMS is inherently scalable allowing future growth and customization of the system without outside support or additional licensing.